Brig. Gen. Abner Doubleday (June 26, 1819 – Jan. 26, 1893). He was a U.S. Army officer and Union general in the Civil War. He fired the first shot in defense of Fort Sumter, the opening battle of the war and saw combat action at Second Bull Run, South Mountain, and Antietam. He had a vital role in the early fighting at the Battle of Gettysburg. After the war, he continued to serve in the Army and even obtained a patent on a cable car railway. He left the Army in 1873 and became a lawyer. Doubleday is often credited with inventing baseball. The club first started play in 1842 (playing in Manhattan), but it was not until 1845 that the club formally organized. The American Civil War was actually a boon for the fledgling sport of base ball (so described as two words in most publications until the change to a single word somewhere between 1910 and 1930). Although the NABBP was founded by clubs from the New York City area, base ball was being played in the north and the south during the War Between the States. The movements of soldiers over great distances, as well as the exchange of prisoners, helped spread the game’s rules and style of play over a wide area of the country and among men from a variety of cultural backgrounds. The game provided soldiers with a means of escape from the hardships of war, and in so doing, a foundation was planted for the sport to become America’s pastime. The sport allowed a further kinship to be developed between the men, the importance of teamwork was accentuated, and the boosts in morale that the game afforded helped to weave the game of base ball into the lives of Civil War soldiers. 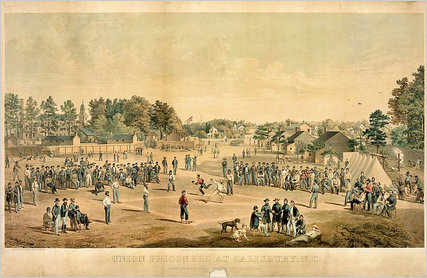 Library of Congress - Union prisoners playing ball at Salisbury, N.C., ca. 1863. In late March and early April 1861, ballplayers in dozens of American towns looked forward to another season of play. But they were not highly paid professionals whose teams traveled to Florida or Arizona for spring training. Rather, they were amateur members of private organizations founded by men whose social standing ranged from the working class through the upper-middle ranks of society. There were no formal leagues or fixed schedules of games, although there were regional associations of clubs that drew up and enforced rules for each type of bat and ball game. Contests between the best teams attracted large crowds (including many gamblers), and reporters from daily newspapers and weekly sporting magazines wrote detailed accounts of the games. The English national game of cricket was the first modern team sport in the United States. During the 1850s, an estimated 10,000 English immigrants and native-born men and boys founded about 500 clubs in at least 22 states in the Union. By 1861, Philadelphia had become the cricketing capital of the nation, boasting the most organizations and the largest contingent of proficient, American-born players. But cricket also faced major challenges from two upstart versions of baseball that had recently exploded in popularity. “The Massachusetts game” reigned supreme in Boston and most of New England, while “the New York game” ruled Manhattan, Brooklyn and New Jersey.